In March of eighteen eighty-nine, Grover Cleveland left the White House after four years as president. He had been defeated by Benjamin Harrison. As they were leaving, Cleveland's wife, Caroline, spoke with a member of the White House staff. She said: "I want you to take good care of everything. I want to find it the same when we come back. And we will be back -- in four years." Caroline Cleveland was right. She and her husband moved back into the White House after he became president again in eighteen ninety-three. 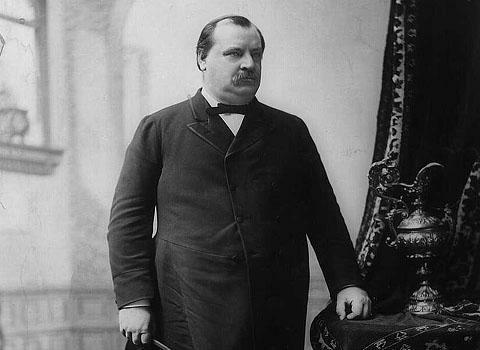 Grover Cleveland is the only man to serve two terms separated by the administration of a different president. This week in our series, Shirley Griffith and Frank Oliver begin the story of Grover Cleveland's second presidency. SHIRLEY GRIFFITH: Grover Cleveland did not want to be president again. But he was worried about the future of the United States. He did not think President Harrison could solve the serious economic problems the country faced. President Harrison had approved very high taxes on imports. He also had approved an increase in the supply of silver money. Grover Cleveland said both actions had hurt the economy. He also feared that Harrison was not strong enough to oppose the demands of special interest groups in the Republican Party. Cleveland believed he was the only Democrat who could defeat Harrison. He won his party's nomination. And he was easily elected to a second presidency. FRANK OLIVER: Grover Cleveland immediately turned to the nation's economic problems. The country seemed headed for a serious depression. Only a few days before Cleveland's second inauguration in eighteen ninety-three, a major railroad failed. Then another big company declared failure. This set off a selling panic on the stock market. In the next few months, almost eight thousand businesses failed in the United States. Four hundred banks closed. One million workers lost their jobs. The prices of farm products fell lower than ever before. And thousands of farmers -- unable to pay their debts -- had to give up their farms. SHIRLEY GRIFFITH: Experts offered a number of different reasons for the depression. Some said it was a plot by members of the stock market to ruin farmers and seize their land. Some said it happened because American factories were producing more goods than people could use. Still others said the problem was caused by the government's money policy. For many years, the United States and other nations used both gold and silver as money. Paper money was used to represent a nation's gold and silver holdings. The value of silver was tied to the value of gold. In the United States in the early eighteen hundreds, fifteen ounces of silver had the same value as one ounce of gold. This value did not change until after eighteen sixty. That was when mines in the western United States began to produce large amounts of silver. The extra silver caused the price of the metal to fall. FRANK OLIVER: In eighteen seventy-one, Germany declared that it would no longer support its paper money with silver. Instead, it would use only gold. Other European countries quickly did the same thing. The United States did, too. In eighteen seventy-three, Congress passed a law that stopped the government from using silver as money. Western silver producers protested. They put great pressure on lawmakers to change the law. Five years later, Congress passed a compromise bill. The compromise bill said the government could issue limited amounts of silver money. It said the government must buy two million dollars' worth of silver each month for that purpose. SHIRLEY GRIFFITH: Twelve years later, during President Benjamin Harrison's administration, Congress passed a new silver purchase bill. It said the government must buy four-and-one-half million ounces of silver each month. The Treasury Department would buy the silver with new paper money that could be exchanged for silver or gold. The new law increased the amount of silver money used in the United States. The country soon became sharply divided on the issue of silver money. Wealthy businessmen and bankers did not want to use silver money at all. They wanted the country's economy to be based only on gold. This was what was known as the gold standard. They believed the gold standard would keep the value of the dollar high. Using silver, they said, made the dollar less valuable. FRANK OLIVER: Farmers, laborers and others wanted to use silver money. And they wanted an unlimited supply of it. Without silver, they said, the country's money supply would be too small. Gold would increase in value. People who had borrowed money would be hurt. They would have to pay back loans with dollars that were more valuable than those they had borrowed. President Cleveland supported the gold standard. He opposed any use of silver for money. He said the United States should use only gold, as other nations did. The law had caused businessmen and investors to lose faith in the government's money policy. They were afraid their money would drop in value, as more silver money was put into use. Investors began to withdraw their money from businesses. Banks began demanding early payment of loans. Everyone wanted gold. They took their paper money and their silver to the government and exchanged them for gold. In eighteen ninety, when the Silver Purchase Act was passed, the government held almost two hundred ninety million dollars in gold. After two years, withdrawals had cut that amount to one hundred million dollars. FRANK OLIVER: President Cleveland and other administration officials began to worry. It was possible that gold holdings might fall so low the government could not support the dollar. Cleveland decided the only answer was to get Congress to kill the silver purchase law. Then the government could stop buying silver. It could return to the gold standard. The Congress was not in session, however. It would not meet again for several months. President Cleveland did not want to wait. He believed the problem was too serious. So, he called a special session of Congress. The president did not expect an easy time with the Congress. Many congressmen supported silver money -- especially those congressmen from silver-producing states in the west. SHIRLEY GRIFFITH: President Cleveland believed he could get Congress to kill the silver purchase law. But if he showed any weakness, the fight would be lost. Then, just before the congressional debate, he learned he would need an operation. He felt a rough spot in the top of his mouth. It got bigger and more painful. Doctors examined the spot. It was a cancer. President Cleveland asked how long he could wait to have the cancer removed. "If it were in my mouth," one of the doctors said, "I would have it removed immediately." FRANK OLIVER: Cleveland agreed. But he said the operation would have to be kept secret. News from the White House often affected short-term activity on the stock market. News that the president's life was in danger could cause the nation's economic crisis to become worse. Cleveland decided to have the operation on a friend's boat in New York Harbor. Newsmen were told he was going sailing with his friend. Doctors made final preparations. They were not afraid of the operation. But they were afraid of what would happen if news of the operation were leaked to the press. One of them spoke with the boat's captain. "If you hit an underwater rock," he said, "hit it good and hard, so we will all go to the bottom." SHIRLEY GRIFFITH: As the boat moved slowly up the East River in New York, the doctors put President Cleveland to sleep with an anesthetic drug. Then they began the operation. That will be our story in the next program of THE MAKING OF A NATION. BOB DOUGHTY: Our program was written by Frank Beardsley. The narrators were Shirley Griffith and Frank Oliver. You can find our series online with transcripts, MP3s, podcasts and images at www.unsv.com. You can also follow us on Facebook and Twitter at VOA Learning English. Join us again next week for THE MAKING OF A NATION -- an American history series in VOA Special English.